Be met at the exit of the airport; you will see the guide who is holding a paper sign with your name on for you to recognize. The rest the day is free, arrange by yourelf. Morning visit at Mutianyu Great Wall, the most spectacular section of Great Wall but less crowed and then explore the Changling Tomb of Ming Tombs. Drive back downtown and drop by the Jade Factory to appreciate Chinese handicraft culture. Pay an exterior visit to the Bird’s Nest and Water Cube. Enjoy a thrilling Chinese Acrobatics Show before being transferred back to hotel. 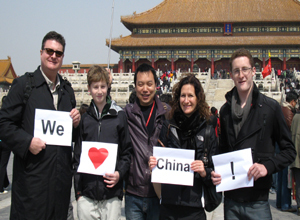 Spend the morning in the Tiananmen Square and the majectic imperial palace Forbidden City. Afternoon sightseeing at the beautiful imperial garden Summer Palace to experience the leisure life of emperors and their concubines. Drop by the Silk Factory to learn about the Chinese silk cutlure. Marvel at the majestic imperial complex Temple of Heaven where grand sacrifice ceremonies to heaven were hosted by Chinese emperors. Move on to the old Beijing Hutong area to experience past Beijing life, by taking a Hutong rickshaw trip, visiting a local Hutong family and learning to make Chinese dumplings, as well as having lunch together. Be transferred to airport for departure. Departure Every Tuesday with minimum of 2 people. Your tour guide will be at the exit of the airport. A paper board with your name will be held, and transfer you safely to the hotel. Later start tour with Temple of Heaven, which is the largest ancient imperial worship architecture group in the world. After dinner, enjoy the Chinese Acrobatics Show. This morning, you will visit the world’s largest urban center square, Tiananmen Square. Walk through the square to the Golden Water Bridge, you will enter the largest as well as best-preserved imperial palace complex, Forbidden City. In the afternoon, pay a visit to Summer Palace, a fantastic royal garden to admire the peaceful landscape and magnificent architecture. 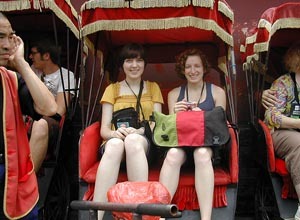 Later tour to the silk factory, and soak in the Hutong with rickshaw, which let you know the real life of local people. Today, we are heading to Mutianyu Great Wall with round trip cable car, one of the greatest miracles in the world which winds up and down across mountains, grasslands, deserts and plains of China like a huge dragon. After lunch , pay a visit to Ding Tomb of Ming Tombs, the only one of the Ming Dynasty Tombs to have been excavated. Then transfer back to the hotel. After beakfast, your tour guide and driver will drive to airport and fly to your next destination. Our tour guide will pick you up at Beijing airport, holding a paper sign with your name on at the exit, then you will be transferred to hotel. The rest of the day is free time. In the morning, visit the historic Tiananmen Square and the majestic imperial palace Forbidden City nearby. Soak in the Temple of Heaven, where the empeors worshiped heaven for good harvest. Drop by pearl factory, before the Chinese Kung Fu Show enjoy dinner at Jinsong Qujude Roasted Duck Restaurant. Today you will be able to see the World Heritage-Great Wall of China. 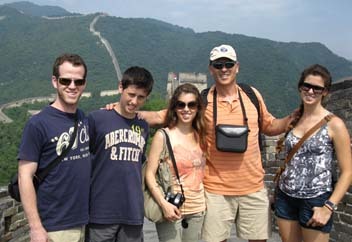 We select Mutianyu Great Wall which is less crowded and preferred by foreign tourists. After lunch, pay a visit to Chang Tomb, the final resting place of the third Emperor in the Ming Dynasty. Tour ends with Sacred way, transfer back to hotel. Have a beautiful morning in the royal garden Summer Palace. Drop by silk factory, have an exterior visit to Bird’s Nest and Water Cube. Be transferred to airport or railway station and departure to your next destination.